In order for an architecture, engineering or construction firm to maintain its operation and grow its business, it must continue to seek new opportunities where its services can help a client with its architectural, engineering and/or construction needs. The common solution is to employ a business developer, which can be part of marketing, but is really a sales function where prospects are identified and relationships are developed. The solution is for the business to provide the proper environment for business developer to be successful. This topic addresses the big picture of the business developer's role from legal and business planning perspectives and focuses on the process to become a successful business developer. 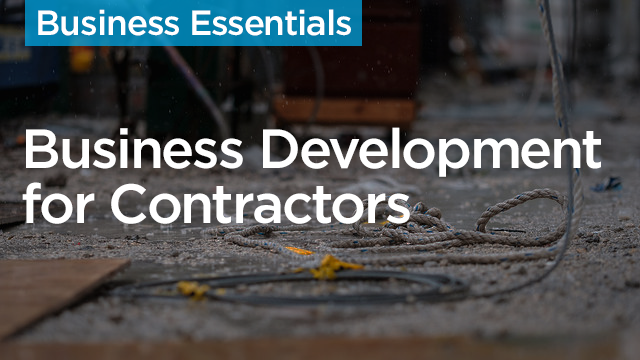 Understand the basic practices of business development and how they might be applied to your business. Learn how to best protect your trademarks and intellectual property. Learn how the right marketing tactics and strategic planning can elevate your business. Become familiar with the role of the business developer and how they can be leveraged to grow your prospect base.